For snacking anytime and of course, during festive seasons. Pretty much a popularity amongst the Chinese during Chinese New Year. However, you need to note that these are not the original crab sticks. They are actually, man-made crab sticks. How shall we call these crab sticks sold in packets? Can I say imitation crab sticks or artificial crab sticks? Right? And the other you should be aware about is, the time for slicing crab sticks into really thin pieces, and the time for frying. 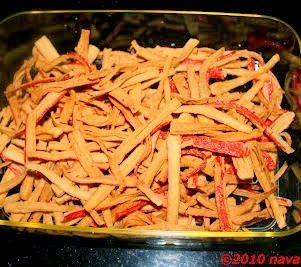 Otherwise, such an easy thing to crispy fried crab sticks. But crunching in after frying? Easy mouth motor. Absolutely. 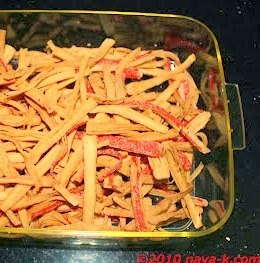 Peel and tear crab sticks, either by hand or with a sharp knife, then slice into thin stripes. Fry in batches till brown, crispy and crunchy. Drain off excess oil, simultaneously toss in salt and pepper. Don't forget to trend alongside "cook with nava-k" on every other social media pleassee! !